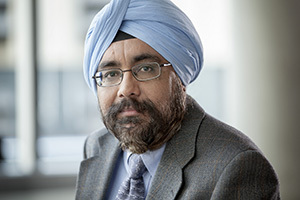 Dr. Harjeet Bhabra became the Dean of the Sobey School of Business at Saint Mary’s University on September 1, 2018. He is a professor of finance. Dr. Bhabra brings over 20 years of experience in university teaching, research and leadership, having served as Associate Dean of Research and Research Programs (2010-2016) and as the Director of the MBA and Certificate in e-Business Programs (2004-2006) at Concordia University. Dr. Bhabra’s principal research and teaching interests are in corporate finance and investments. Prior to joining Concordia University in 1997, he taught at SUNY-Binghamton (New York). His PhD was attained at the University of Missouri-Columbia. His research has been published in numerous top-ranked business journals, and served as a regular reviewer for many finance journals. He is an experienced presenter and has supervised PhD student research in areas of finance involving capital structure in emerging markets, IPOs, M&As and corporate social responsibility.